This is the prototype I made for the swooshy plane I sent in the 2019 spring swap. It’s similar in construction to that one, being stabilized elm sides, then African mahogany, and birch with an ipe sole. This one got a stabilized hickory wedge and I used a smaller sandwich of wood in the middle. After putting it together, it was pretty short in my hand, and I decided I needed to make the real plane longer. I also tried out using a Lie-Nielsen beading tool to decorate the sides of the plane. I think it worked pretty well, and I decided that was enough decoration for both planes. 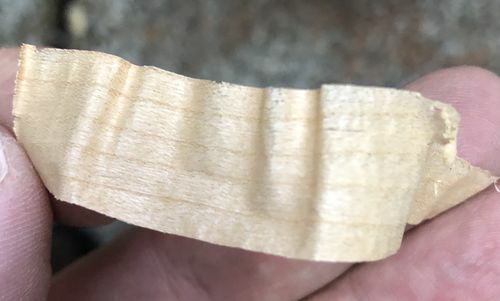 Unfortunately, the elm sides were exactly as long as they are in both of these planes, and I didn’t have any more stabilized elm on hand, so I cheated and made the tail of the plane more wedge shaped. That also worked to get me closer in shape to that of a 35 Auburn Speedster, which I think is a very good looking car. But this version, which reminds me more of a VW Beetle or perhaps a Citroën 2CV was what got me to that. And it makes pretty nice shavings anyhow. Added pictures 2-6 which are after two coats of linseed oil and a coat of paste wax. It cleans up pretty good. Great build. Remember the old adage: Give a man a plane and he can plane all day, but teach a man to make a plane and he’ll create all the tools he’ll ever need. Seriously, nice build, sweet plane with nice shavings. Do you have a source for plane parts? I have been thinking of making one or two as well. 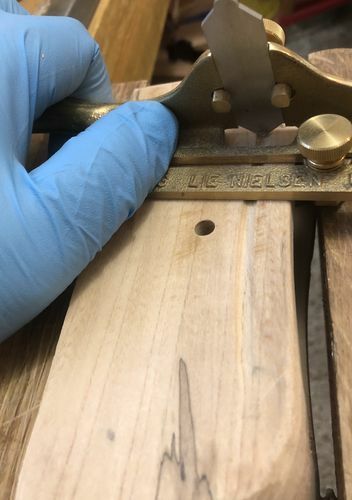 For plane parts, I used the Veritas wooden plane hardware kit. Now that is a plane contribution DP. Pretty Cool, you do great work! Thanks, Kelly. It’s not the prettiest plane in the world, and it’s a little small for my big paws, but it’s a user. And I learned a bunch from not getting it quite right, so I’m happy with it. Also glad I planned enough time to make another one after I’d learned from my mistakes on this one. Great prototype Dave. If it had wings it could fly. Any tool by hand gives us a feeling of success. nice job. Thanks, Dave. I finally got around to finishing it this morning. Oil and wax and it’s prettier now. .... Oil and wax and it’s prettier now…. Oil beef…, DP... where’s the happy snap(s)? Sorry DP, I was looking at my computer screen from the wrong angle and couldn’t see the plane sheen! Or did you gotcha me…? and add those photos overnight. I added those a few hours ago after putting on the wax this morning, Minneapolis time. Just after saying “it’s prettier now”. Gotcha! Phew… thought I had one too many vino after my too many vinos last night. He calls them home made tissue paper.